The whole world was shaken by the massive earthquake and tsunami that struck Indonesia. Around 8 A.M. on December 26, 2004, an earthquake of magnitude 9.1 hit northern Sumatra in Indonesia, and then shook most of the world by causing the deadliest tsunami in human history. The earthquake was so powerful that it slowed down the earth’s speed of rotation by a tiny fraction of a second. The initial shock was followed by more than a dozen aftershocks. Thailand, India, Sri Lanka, and several other places, especially the Western Sumatra Province of Indonesia, which was closest to the earthquake and experienced the full force of the tsunami, all were devastated by the tsunami. At least 250,000 people were killed and many millions of others suffered losses of all kinds. The earthquake happened in the short space of a few minutes at the interface of the India Plate and the Burma Plate. Strains that had accumulated for centuries suddenly gave way as the India Plate pushed the overriding Burma Plate upward. When the fault line between these two plates suddenly slipped, a 750-mile-long seabed break appeared and there was a vertical displacement of forty-five feet in the depth of the ocean. The huge volume of water displaced by such an event became a tsunami, one that swept outward in all directions. The earthquake was the fourth biggest anywhere in the world since 1900. A wall of water thirty feet high, traveling at five hundred miles an hour, swept outward from the epicenter causing the greatest number of casualties in the nearby land of Western Sumatra. Within a few hours, places all over the Indian Ocean were impacted. In the Pacific Ocean, earthquakes cannot be accurately predicted in advance. Once an earthquake is detected it is possible to give three hours’ notice of any tsunami risk. In addition, Pacific people are familiar with tsunamis and are always ready to run to higher ground when a warning comes. There is no similar system in the Indian Ocean. Tsunamis are rare, only seven significant ones in the last century, many of them affecting specific countries only. The first news that reached the western world from Indonesia and the countries that were affected came from Thailand, simply because that country was a tourist center and modern technology was available at the time to give signals and detailed messages to the rest of the world about the tragedy that had happened. The actual damage, of course, was quite different. The loss of life in Thailand, even though it was so close to Indonesia, was less that 5,000, whereas in Sumatra, where the earthquake and the tsunami first hit, the death toll went far beyond the 100,000 level right away. Between Sumatra and Thailand the groups of islands known as the Nicobar and the Andaman Islands were overwhelmed by the tsunami wave that swept over the area quickly after the first event. The first formal warning came from the Pacific Tsunami Warning Center in Honolulu. That, of course, is a center that is designed for the Pacific, and because of the many tsunamis experienced, it has been widely recognized and highly valuable over the years. However, because there is no warning system available in the Indian Ocean, where all the damage would be done, the Pacific Center, immediately had some information about the earthquake and tsunami, and for example, sent out warning signals fifteen minutes after the earthquake. A bulletin was dispatched to all the countries around the Pacific and the countries around the Indian Ocean—Indonesia and Thailand—warning them that a very great earthquake had occurred and precautions should be taken immediately. At that time, within about fifteen minutes of the earthquake, the estimate was that it would be more than a magnitude 8 in terms of the Richter Scale and that, therefore, there was a strong possibility of a tsunami occurring at the same time. There was no living memory of a major tsunami in the Indian Ocean and, in fact, there had been no adequate preparation for that eventuality, simply because of the absence of any tsunamis over the course of the twentieth century. While there was much preparation for giving out warnings, it was a very inefficient system. For example, the official in charge of Indonesia’s tsunami warning system had received the e-mail from the Pacific warning center on the morning immediately following the earthquake. The e-mail message had arrived within a few hours of the earthquake, but was not seen until one day later. The official was not at work on that particular morning and so nothing was really done in time to warn any of the countries that subsequently would be affected by the tsunami, because by the next morning, about twelve or more hours later, the tsunami, certainly the first wave of the tsunami, had long before that time reached Africa and all the major damage that was going to be done had already been done. The indifference of the Indonesian officer was matched by the attitude of the equivalent officer in Thailand. When the first news came to the duty officer in that country, his reaction was simply that the earthquake is far away from us and in 1,000 years we’ve never heard of a tsunami affecting this area so it doesn’t seem necessary for me to give a warning out for this one. The general indifference on the part of the duty officers in Indonesia and Thailand may be understandable and, in fact, may not have made any difference to the countries and areas that were first hit. It all happened so quickly because tsunamis travel at more than five hundred mph and there was barely time, even if there had been a warning system, to do much for Thailand, the Andaman and Nicobar Islands and, of course, the area that was damaged more than anywhere else, the western part of Indonesia known as Sumatra. It was a different story for India and Sri Lanka. Because of the distance, it took an hour and a half for the main first wave of the tsunami to reach Sri Lanka, and had a warning been given, undoubtedly there would have been some better outcome and many more lives saved than was the case. That first wave caused the death of more than 30,000 in Sri Lanka and over 10,000 on the eastern shores of India before moving on to sweep still further westward over the Maldives, maybe two and a half hours after the initial earthquake, and then six and seven hours later reaching the Seychelles and the shores of Africa in Somalia. For Indonesia, Sri Lanka, and India, the countries where most lives were lost, it should be remembered that life in all of these areas is essentially sea dependant and the homes are concentrated close to the water and, therefore, in low lying areas. This is why destruction was so total. But beyond the actual numbers of people and the loss of life and homes, there was also the huge destruction of the environment and the long time it would take for recovery. In Indonesia, for example, the largest concentration of coral reefs is located in the very area that was hit by the earthquake. These coral reefs served to trap coastal sediments and protect the coast from high waves that might come from just ordinary weather changes. They, overall, provide an ecosystem that is protective of a large variety of fish life and, therefore, on the livelihood of the people who live in that area. 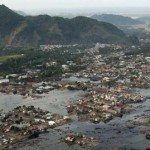 Large stretches of rice patties, as well as mangrove and other forests, were completely wiped out by the tsunami in this part of Indonesia. Overall, the most serious threat to the coastal environment—one that will take a long time to be corrected—was the huge amount of natural and manmade materials that were dragged back into the ocean by the receding waters from the tsunami. This could be vehicles, fuel tankers, trees, and just any imaginable kind of debris. The quantities were huge and the damage will remain there for a long time to come. It was a similar problem with water supplies. There is plenty of water available in this part of Indonesia, but the tsunami, bringing salt water many miles inland, contaminated all the surface waters. This is a very poor area in every respect. People are totally dependent on the resources of the physical environment where they live and there is no sewer system for the disposal of waste, so the septic tanks that did exist were severely contaminated by the seawater, as indeed were the various wells that serve as the source of fresh water for a number of areas. Thailand’s main concern about the tsunami relates to tourism, one of the highest income areas for the country, and so the danger of tourists not coming back to the country for fear of another tsunami was a major concern. Quite apart from that factor, the environment was profoundly impacted. Offshore there are extraordinarily rich collections of sea life, some of them quite endangered and extremely valuable. On shore, two miles of the land surface was inundated and the seawater that came with that event destroyed a large number of fresh water areas on land. Almost all of the lakes within that range of the coast, and therefore within range of the main settled areas of the country, were contaminated and it is not clear how long it will take for that to be corrected. One other country in the path of the tsunami, the Maldives, is completely dependent on tourism, even to a greater extent than Thailand. It is located in the Indian Ocean, west of Sri Lanka. One has only to think about one simple statistic to appreciate how total the devastation was for this country. Eighty percent of the land in the group of islands that constitute this country lie less than three feet above sea level. All together there are more than 1,000 islands forming the country, and maybe two hundred of these are inhabited. Now, of those two hundred, twenty were totally devastated and fourteen of them had to be evacuated. The total population of the country is less than half a million, but it is a very popular destination for tourists because of the climate and because of the uniqueness of the ocean setting everywhere throughout the country. Approximately 13,000 people had to be rescued after the tsunami, and all together probably one-third of the entire population suffered some loss of home, possessions, or livelihood. There was so much flooding that electricity was cut off for many of the islands and there was no communication from island to island for considerable time. One out of every four of the inhabited islands had experienced serious destruction to its jetties and its harbors and, therefore, to its links with the outside world and its availability for the tourism industry. Needless to say, there was a huge outpouring of sympathy and provision of money for rehabilitation from all over the world. Nothing on this scale had been experienced in living memory so, being a natural catastrophe, everybody felt a degree of responsibility for helping. Getting quantities of money contributed is one thing of course, but getting the supplies and resources for survival to the needy areas is quite another matter altogether. If resources, medication and food are not provided almost immediately, then you have the secondary effects of the disaster—hunger and disease. So everything depends on the speed with which supplies can be delivered to the affected areas. The huge distances involved are in themselves a major hurdle for relief agencies and people providing support to the needed areas. The distance from Indonesia to Sri Lanka to Somalia really takes one halfway around the world. Quite apart from the logistics of getting supplies to needy areas, there were two other factors that affected the recovery. Number one, there was crime and the opportunities were offered to people who want to take advantage of the situation to grab what they can. This certainly was a factor in a number of areas and relief agencies had not only got there as quickly as possible, but also were unable to come with some protection so that what they were bringing would not be stolen right away. Beyond the crime elements, there was also the range of political considerations. For example, the Indonesian government was very reluctant to accept U.S. warships near its coasts, even though that was the only available transportation method for getting food and medical supplies to the desperate needs of western Sumatra. One compromise that was arranged was to ensure that these warships would stay for a limited length of time. So even with the generosity that was being provided, there were political considerations in some countries that were far greater than the care of their own people. In Sri Lanka there was a very special situation that confronted the relief agencies. Sri Lanka has had a civil war that has been going on for many years. The Tamal Tigers in the northern part of the country are fighting for the independence of their part of Sri Lanka. This has been a violent war with many thousands killed over the years. When the relief agencies arrived there was some dispute with government authorities in Sri Lanka about whether the relief should be equally distributed to the rebel areas of the country as well as the other parts further south. This took a lot of time and discussion and the only way it could have been resolved was when relief agencies insisted that there had to be equal distribution or they would have to leave the country entirely. They could not choose those who were going to get help and those who would get no help. The year 2004 ended in a tragedy of unprecedented scale and dimension. Many lessons can be drawn from the disaster that affected nine countries on two continents and claimed over 300,000 lives. One important lesson that emerged from the disaster was the need for monitoring and early warning systems. The loss of human life would have been considerably less had coastal communities had more knowledge and greater awareness of a tsunami risk. The extent of the disaster brought to light the overall lack of awareness and low level of national preparedness. It was seen as imperative, therefore, to build systems to make communities safer and educate citizens on the nature of the threats. A brand new organization was set up to coordinate emergency preparations. An endorsement for it was received from six of the states that were damaged by the tsunami— Bangladesh, Cambodia, Nepal, Pakistan, Philippines, and Thailand.